Flat stock material made from either mdf or wood. Flat-Stock Molding This simple piece of flat-stock molding is often sold under the name “lattis molding.” At least that’s what they call it at Lowes Home Improvement. 5-1/2″ Wide MDF Flat-Stock This pre-primed mdf flat-stock is the perfect size for creating Craftsman style moldings — door trim, baseboard and even picture rail. Details below. 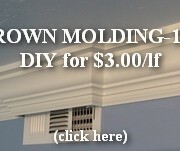 3-1/2″ wide MDF Flat-Stock Most molding & millwork retailers or lumber yards sell some form of this flat-stock. 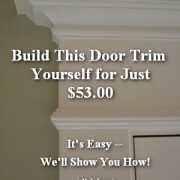 This one has a lot of uses, from wainscoting to door trim to crown molding.